My journey to health and fitness began when my Dad, who was almost 70 years of age, suggested that we take part in a small triathlon at the caravan park we often visited on the west coast. I knew that I had a lot of preparation to do as I was nowhere near as fit as I had been in my younger days. Years of overeating, over drinking and far too little exercise had resulted in my weight peaking at 17½ stone. I was considerably less healthy than my Dad, who was over 20 years older than me. The time had come to eat less and drink less. I ate only three healthy meals a day with no snacks in between apart from the occasional piece of fruit. Next was the exercise. I started cycling and swimming, but my biggest challenge by far was to get running, something I had tried on several occasions but had never enjoyed. Even short distances were very hard and left me feeling exhausted and with negative thoughts such as “I am just not a natural runner!” Somehow, I managed to keep at it and I ran at least three times a week and as the weight came off the distances increased and the times improved. When the big day came I completed all three sections of the triathlon and my times were respectable for my age group – I really felt great. “No need to stop now!” I thought, and later that year I joined my local jogscotland group – North Merchiston in Edinburgh, run by Nan Mollison. Now I have been running for several years and have taken part in many events. At the moment, I’m making a big effort to turn to trail running and hill running, so have competed in events which were quite different to anything from previous years, including the Aberfoyle Trail Run, Ben Gullipen Hill Race, and The Seven Hills of Edinburgh. As I get older and remain quite serious about my running I find that I am focusing more and more on my diet. About three years ago I turned pesceterian, then vegetarian and then became vegan. 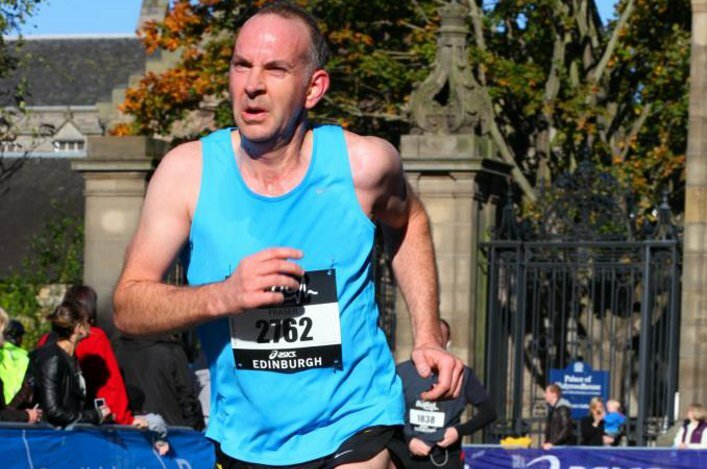 Now at the age of 54 I feel fitter than ever and look forward to whatever challenges await me in the years to come as a vegan runner and, of course, as a proud member of jogscotland.